This book and accompanying MSA short course was first considered in 1987 in response to what seemed to be a growing interest in the chemical reactions that take place at mineral-water interfaces. 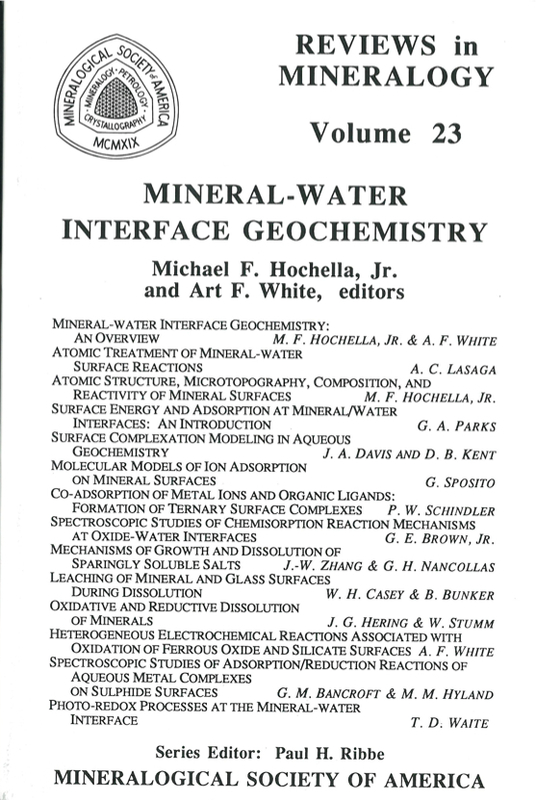 Now, in 1990, this area of work is firmly established as one of the major directions in mineralogical and geochemical research (see Chapter 1). We believe that there are two major reasons for this. The first is that there is a growing awareness within various earth science disciplines that interface chemistry is very important in many natural processes, i.e., these processes cannot be adequately described, much less understood, unless the role of interface chemistry is carefully considered. Perhaps the best illustration of this increase in awareness is the diverse backgrounds of the scientists who will be attending the short course. Participants have research interests in aqueous and environmental geochemistry, mineralogy, petrology, and crystallography. In the final list of participants, one-quarter are from outside the United States, and include scientists from Australia, Canada, England, France, Israel, The Netherlands, Sweden, and Switzerland. The second reason that this field is one of the major new research directions in the earth sciences is because many methods, both experimental and theoretical, have relatively recently become available to study mineral surfaces and mineral-water interfaces. Many important spectroscopic techniques now used routinely to characterize surfaces and interfaces were not available twenty years ago, and some were not available just five years ago. To emphasize the importance of these methods, two Nobel prizes were awarded in the 1980's to the developers of x-ray photoelectron spectroscopy (XPS) and scanning tunneling microscopy (STM). We have directed ourselves and the other authors of this book to follow the general guidelines of writing for "Reviews in Mineralogy". However, for the subject of mineral-water interface geochemistry, this is not easy because the field is far from mature. Several chapters are not reviews in the traditional sense in that they cover research that is relatively recent for which a considerable amount of work remains. In any case, we believe that this book describes most of the important concepts and contributions that have driven mineral-water interface geochemistry to its present state. We begin in Chapter 1 with examples of the global importance of mineral-water interface reactions and a brief review of the contents of the entire book. Thereafter, we have divided the book into four sections, including atomistic approaches (Chapters 2- 3), adsorption (Chapters 4-8), precipitation and dissolution (Chapters 9-11), and oxidation-reduction reactions (Chapters 11-14).